The form-factor in this edition has been changed from US letter to 6×9 inch US trade paperback size, making the two volumes more compact than previous versions. The two volumes may be purchased separately or together. The cost for the pair is US$16.24, plus postage and applicable taxes. Please visit http://www.lulu.com/spotlight/unicode to order. 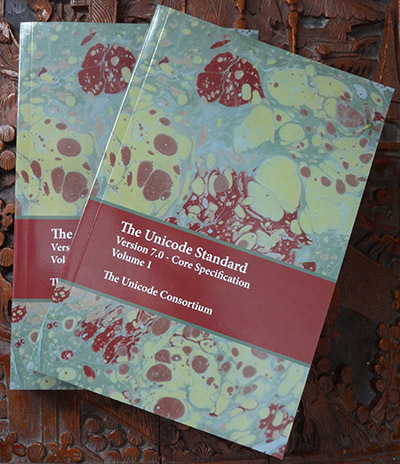 Note that these volumes do not include the Version 7.0 code charts, nor do they include the Version 7.0 Standard Annexes and Unicode Character Database, all of which are available only on the Unicode website, http://www.unicode.org/versions/Unicode7.0.0/. Purchase The Unicode Standard, Version 7.0 - Core Specification.